Fifa president Sepp Blatter has rejected calls for the report into alleged World Cup bidding corruption to be made public. American lawyer Michael Garcia investigated the bidding processes for the 2018 and 2022 World Cups, filing his findings to Fifa this month. Garcia wants his report published, and Uefa president Michel Platini is not opposed to it being disclosed. But Blatter said Fifa is "bound by regulations". Any decision to publish now rests with Fifa ethics chief Hans-Joachim Eckert, who is currently considering the report and is expected to announce his ruling next spring. On Saturday, English Football Association chairman Greg Dyke said it was "essential" the report was published to "take away the smears and suspicions". Speaking at an FA grassroots event in Lowestoft, Dyke said the FA board had met on Friday and would be asking for Fifa to overturn its current position not to disclose the document. The 2018 World Cup was awarded to Russia with Qatar selected for 2022. As well as Garcia, who is the chairman of the investigatory chamber of Fifa's ethics committee, Fifa vice-presidents Jeffrey Webb, Prince Ali bin Al-Hussein of Jordan and Jim Boyce have also called for the key findings of the report to be made public. Blatter, meanwhile, played down the controversy over luxury watches being given as a gift to Fifa executive committee officials by Brazil World Cup organisers. "Fifa's leadership perpetuates a perception of graft and grubbiness that is now, rightly or wrongly, synonymous with the organisation in the minds of many supporters and members of the 'football family'." Fifa officials have been given until 24 October to return the watches handed out at the World Cup, as football's governing body claims the gifts break its code of ethics. Platini has already said he will not return his watch, and Blatter said: "This is a non-problem." 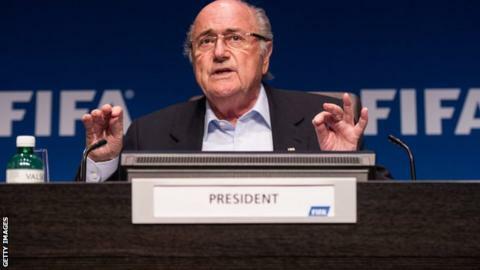 Blatter also confirmed he would stand for a fifth term in charge of world football in an election next year. The 78-year-old has been Fifa's leader since 1998, and he said: "I have announced to the executive committee... that I will accept the demands of different associations and federations (to stand for election) to serve Fifa for a fifth mandate." Blatter has not yet submitted formal nomination papers, which must be signed by five of Fifa's 209 member associations, with 29 January the deadline to do so.